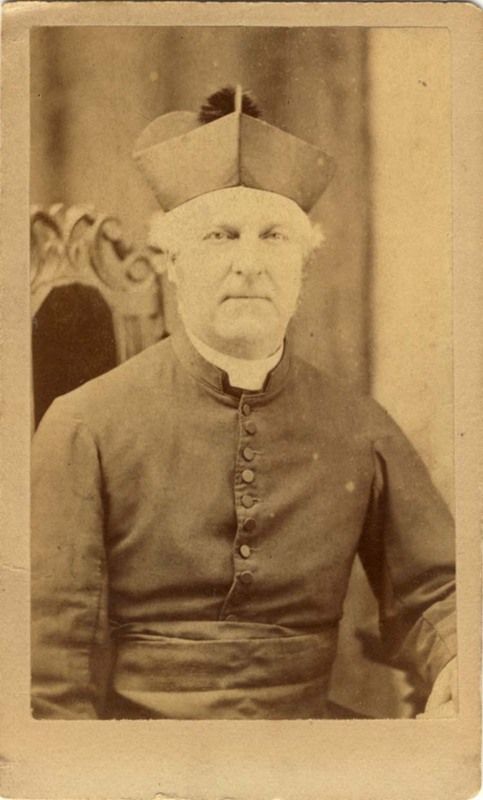 William Feldwicke was born in Brighton in 1849, the son of William Feldwicke senior (c1823-1899) and Sarah Sophia Carter (1822-1890) [William Feldwicke junior was baptised at St Nicholas Church, Brighton on 4th February, 1849]. William Feldwicke senior, who worked as a sales assistant in a fancy repository, married Sarah Sophia Carter (born 1822, Chichester, Sussex) at St Nicholas Church, Brighton on 11th October 1846. The couple's first child, Sarah Sophia Feldwicke, was born the following year [Sarah Sophia Feldwicke was baptised on 15th August 1847]. 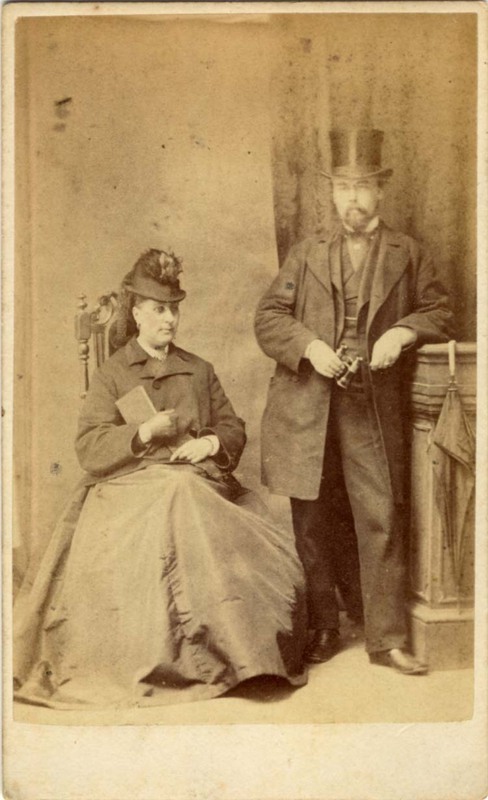 At the time of William Feldwicke's birth in 1849, William and Sarah Feldwicke were living with their infant daughter in Kew Street, Brighton. On the 1851 census return for 7 Kew Street, Brighton, William Feldwicke senior, aged 28, gives his occupation as "Assistant in Fancy Repository". William's twenty-eight year old wife, Sarah, is described on the census return as a "Dressmaker". Two children are entered on the return - Sarah Sophia Feldwicke, aged 3, and two year old William Feldwicke. These two appear to be the only children born to William and Sarah Feldwicke during a marriage that lasted over 40 years. When the 1871 census return for Brighton was taken, William Feldwicke junior was twenty-two years of age and living with his parents at their house at 30 Hampden Road, Brighton. His father gives his occupation as "salesman" and he was probably still working at the same fancy repository. William Feldwicke junior is described on the census return simply as an "Assistant". Presumably, William Feldwicke junior was working as an assistant in the fancy repository where his father was employed, but it was around this time that William Feldwicke took up photography so he might have been working as an assistant to a photographer. 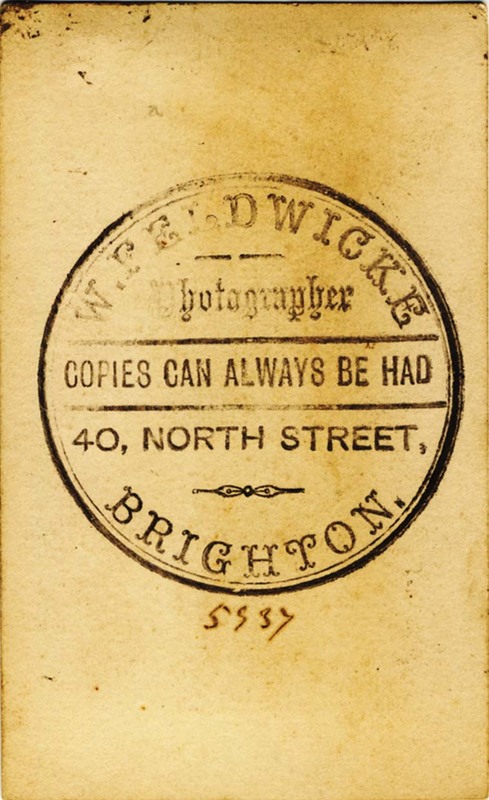 Around 1872, William Feldwicke took over the photographic studio at 40A North Street, Brighton. These business premises had been used as a photographic studio since at least 1859. Over a period of ten years, half a dozen photographers had operated from 40A North Street, each staying in business for only a few years. 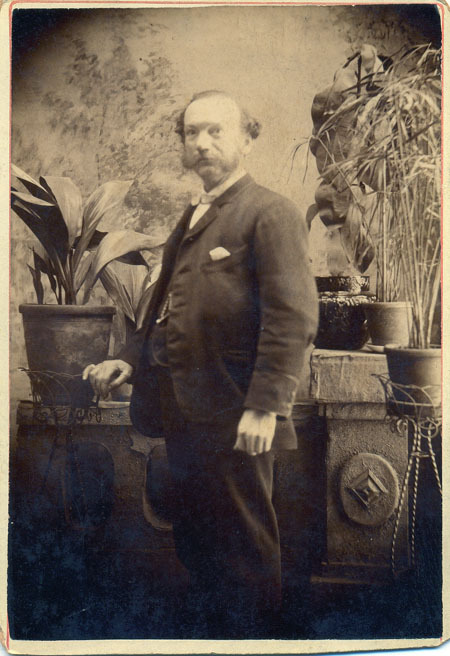 William Feldwicke was to run the North Street studio over a period of thirty years, from around 1872 to 1903. 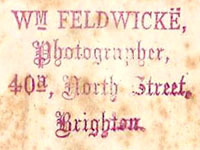 (William Feldwicke is first recorded as a photographer at 40A North Street, Brighton in the trade section of Page's 1873 Directory of Brighton). 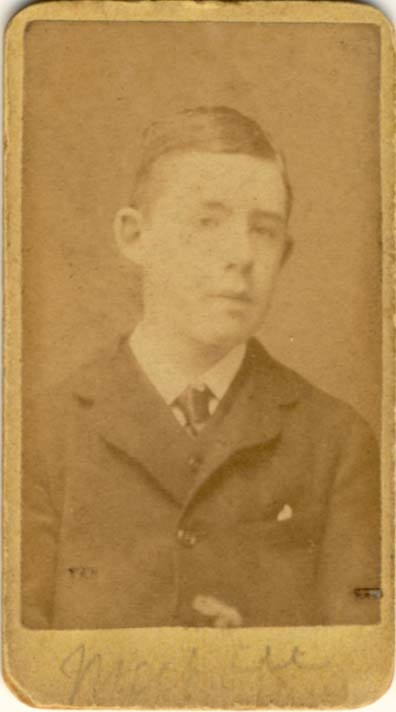 In 1881, William Feldwicke was still living at 30 Hampden Road, Brighton with his parents and sister, Sarah. William Feldwicke senior was apparently working at the same fancy repository - he is described on the census return as an "Assistant in the Fancy Business". Both William and his sister were single. 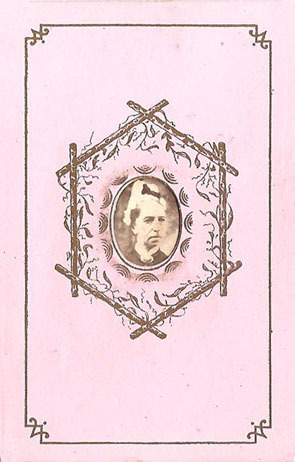 Sarah S. Feldwicke is entered as a "Dressmaker", aged 33. 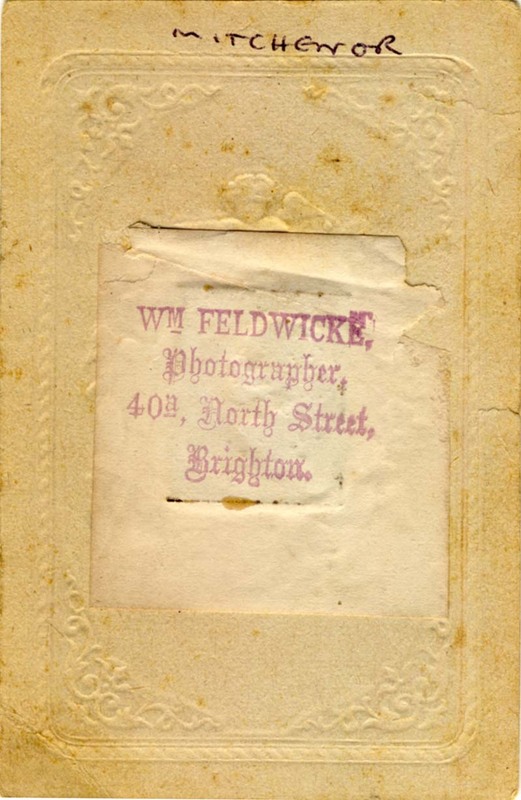 William Feldwicke is recorded as a "Photographer", aged 31. 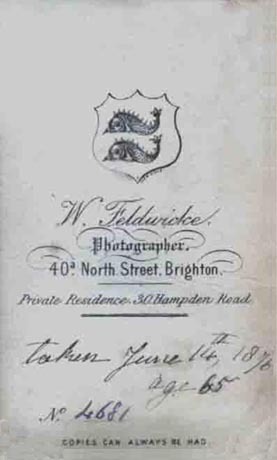 For a brief period around 1892, William Feldwicke appears to have let out his Brighton studio to a photographer called Lascelles, but, by 1896, Feldwicke was back at 40A North Street. By 1899, both William Feldwicke's parents were deceased so he became the householder at 30 Hampden Road. William's sister, Miss Sarah Feldwicke, died unmarried in 1900 at the age of fifty-two. When the 1901 census was taken, William Feldwicke was therefore living alone at 30 Hampden Road, Brighton. William is described in the 1901 census return as a single man of fifty-two and his occupation is given as "Photographer (own account)". 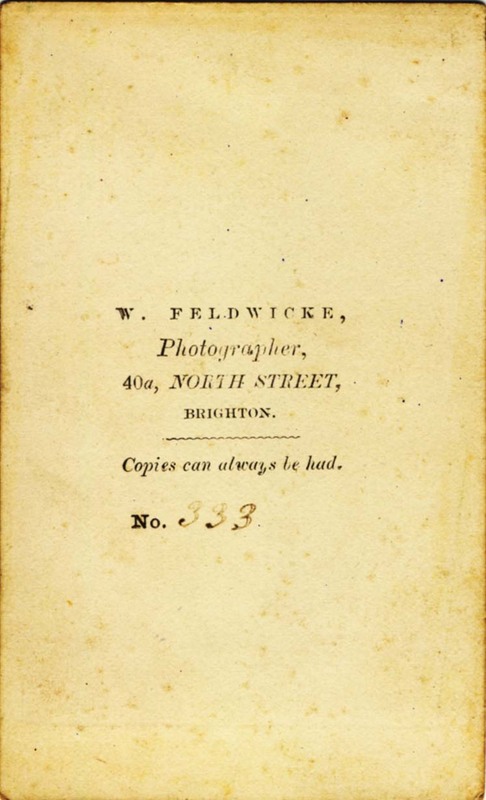 This suggests William Feldwicke was a self-employed photographer who did not employ assistants at his North Street studio. 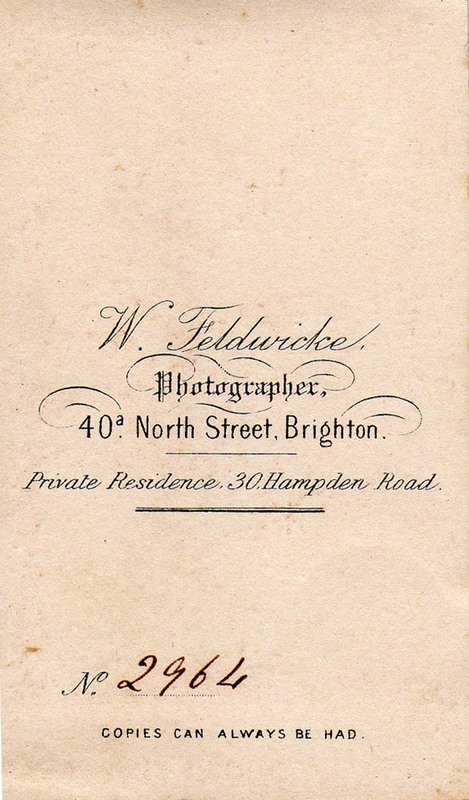 William Feldwicke continued to run the studio at 40A North Street, Brighton until about 1904, when it passed to Albert Kember (born 1868, Croydon, Surrey), a cousin of the Brighton photographer Henry Thomas Edwards (born 1857, Hurstpierpoint, Sussex) and a former assistant photographer at H. T. Edward's studio in Lewes Road, Brighton. [LEFT] A trade label usually employed by the Brighton photographer William Feldwicke to secure tiny "American Gem" portraits to a carte-de-visite mount. This particular example from William Feldwicke's studio at 40a North Street, Brighton, was affixed to the reverse of a small memorial portrait. See the small portrait of a woman, believed to be Mrs Sarah Bowen (c1805-1880), illustrated below. [ABOVE] Portrait of a Priest. A carte-de-visite photograph by William Feldwicke of 40a North Street, Brighton. No negative number (c1877). [ABOVE] Portrait of a woman standing by a rustic fence in front of a painted backdrop. A carte-de-visite photograph by William Feldwicke of 40a North Street, Brighton. Negative Number 6057 (c1877). [ABOVE] Portrait of a young woman or girl seated beside a young boy and a little girl in front of a painted backdrop. A carte-de-visite photograph by William Feldwicke of 40a North Street, Brighton. Negative Number 3016 (c1875). [ABOVE] A portrait believed to be of Mrs Sarah Bowen (c1805-1880). 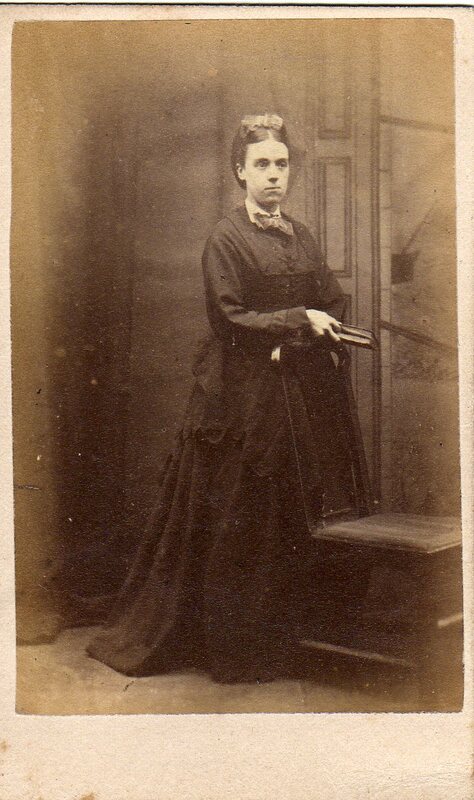 A carte-de-visite produced by William Feldwicke of 40a North Street, Brighton. [ABOVE] Portrait of a seated woman. A carte-de-visite photograph by William Feldwicke of 40a North Street, Brighton. Negative Number 3326 (c1875). [ABOVE] Portrait of a man wearing a bowler hat. A carte-de-visite photograph by William Feldwicke of 40a North Street, Brighton. Negative Number 4652 (c1876). [ABOVE] Portrait of a couple. 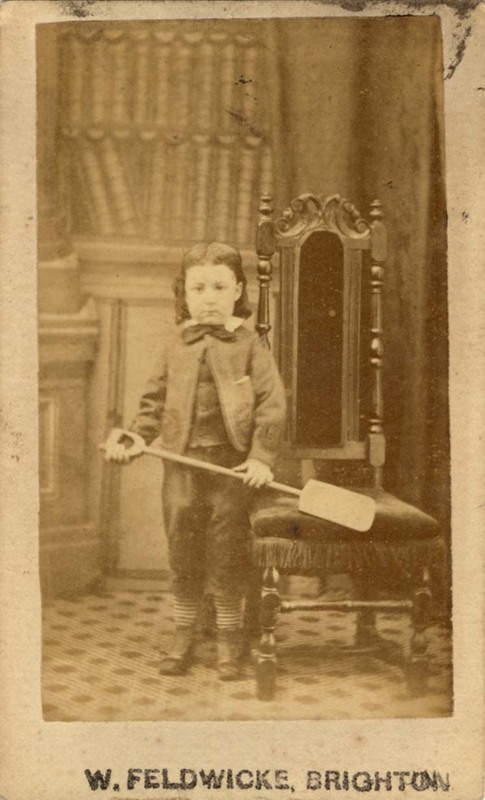 A carte-de-visite photograph by William Feldwicke of 40a North Street, Brighton Negative Number 333 (c1872). [ABOVE] Portrait of a woman standing by a chair. 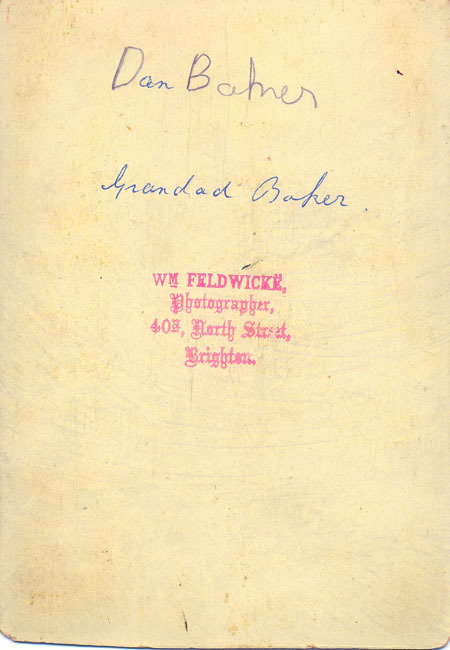 A carte-de-visite photograph by William Feldwicke of 40a North Street, Brighton. Negative Number 2964 (c1874). [ABOVE] Portrait of a woman. An "American Gem" portrait taken at William Feldwicke's studio at 40a North Street, Brighton (c1882). "American Gems" were tiny photographic portraits on thin sheets of iron (ferrotypes). 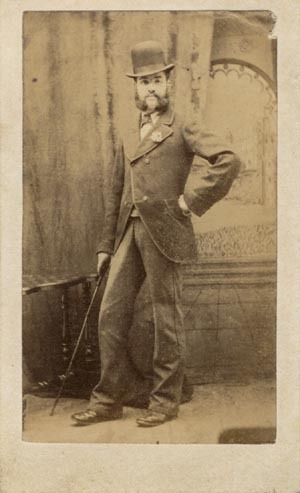 [ABOVE] The back of a carte-de-visite produced by William Feldwicke, Photographer, at 40a North Street, Brighton around 1872. Negative Number 333. 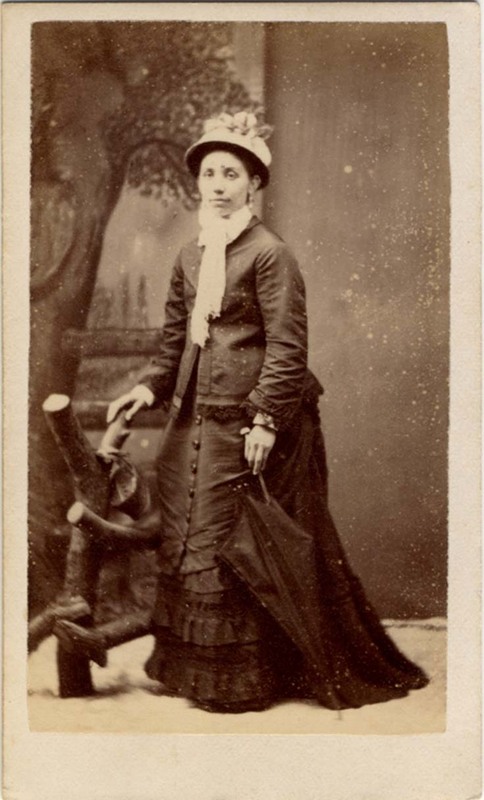 [ABOVE] The back of a carte-de-visite produced by William Feldwicke, Photographer, at 40a North Street, Brighton around 1874. Negative Number 2964. 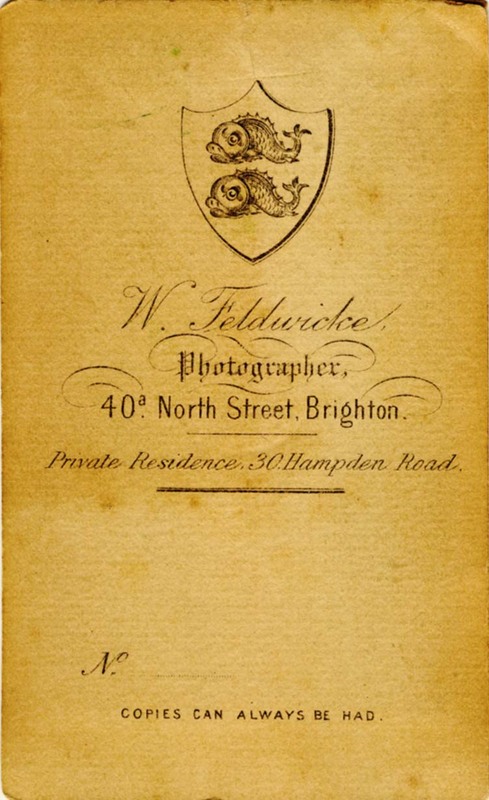 [ABOVE] The back of a carte-de-visite produced by William Feldwicke, Photographer, at 40 North Street, Brighton around 1877. Negative Number 5937. 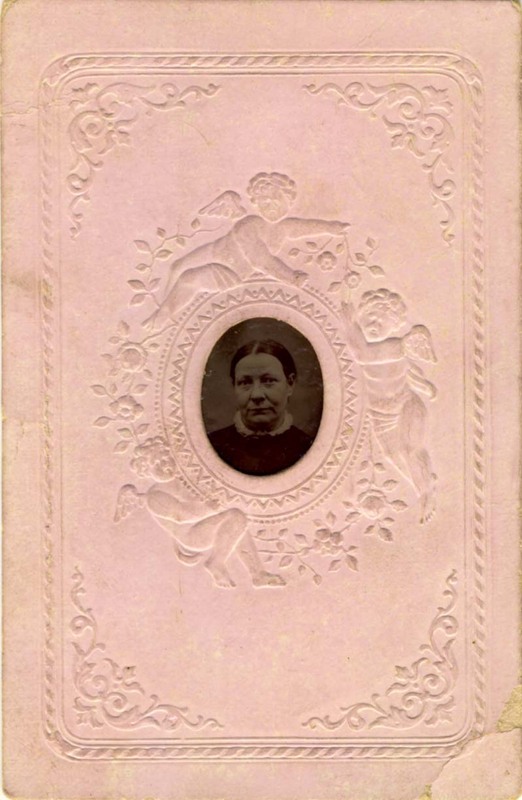 [ABOVE] The back of an "American Gem" carte-de-visite produced by William Feldwicke, Photographer, at 40a North Street, Brighton around 1882. 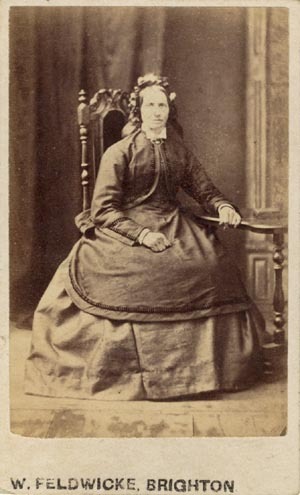 [ABOVE] A portrait of a seated woman identified as Mrs Mary Hider (formerly Mary Sayers). 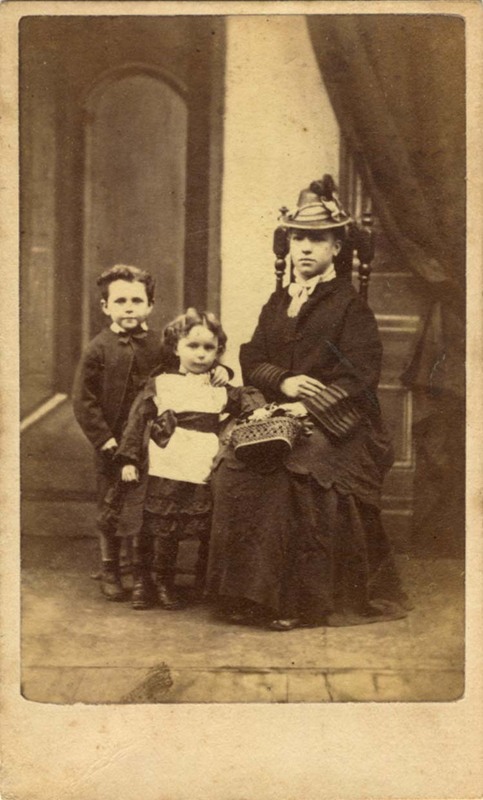 A carte-de-visite photograph by William Feldwicke of 40a North Street, Brighton which carries a date of 14th June 1876 and a Negative Number of 4681. [ABOVE] The reverse of the William Feldwicke carte-de-visite portrait illustrated on the left. Written in ink, below Feldwicke's address, is the inscription "taken June 14th, 1876, age 65" and the Negative Number 4681. Mary Sayers was born in the West Sussex village of Twineham in 1811. A baptism record indicates that Mary Sayers was christened at Twineham on 10th March 1811. The parish register names Mary's parents as Mary and Job Sayers. [Mary Stening had married Job Sayers in Twineham on 3rd December 1810]. The 1851 census records Job Sayers (born c1792, Twineham, Sussex) as a "Farmer of 12 Acres" in Bolney, Sussex. The 1851 census records 59 year old Job Sayers, his wife Mary (aged 67) and their daughter Rebecca, a 26 year old "Dress Maker", residing at Slate House, Bolney. Ten year later, Job Sayers was listed as a 70 year old widower working as a "Carrier" from Slate House, Bolney. On 3rd December 1836 twenty-five year old Mary Sayers married James Hider (born 1816, Henfield), a twenty year old blacksmith, in her groom's native village of Henfield. Mary's husband, James Hilder, was the son of Ann Woolgar and John Hilder (born c1794, Hurstpierpoint, Sussex), a blacksmith of High Street, Henfield. On 2nd October 1837, Mrs Mary Hider gave birth to her first child, Job Hider. Three more children followed - Mary Ann Hider (born 1839, Henfield), Susannah 'Susan' Hider (born 1843, Henfield) and Charlotte Hider (born 1850, Henfield). The 1851 Census records Mary Hider and her family residing in an un-named cottage between The Plough Inn and Chapel House (the residence of George Hall, the Independent Minister of Henfield Chapel) in Henfield's main street (Henfield High Street). On the census return, Mary's husband, James Hider, is described as a 34 year old "Blacksmith". From 1861 to 1874, Mrs Mary Hider and her husband, lived with Mary's father-in-law, John Hider (c1794-1874) in Henfield's High Street. On the census returns for 1861 and 1871, both John Hider and his son James Hider give their occupation as "Blacksmith". In 1876, after nearly 40 years of marriage to blacksmith James Hider, Mrs Mary Hider travelled the 12 miles from Henfield to Brighton, to have her portrait taken at William Feldwicke's photographic studio at 40a North Street, Brighton. Mrs Mary Hider (formerly Mary Sayers) died in Henfield in 1885 at the age of 75. James Hider, Mary's husband, died three years later in 1888, aged 72. Thanks to Darren Hopkinson for providing the cabinet portrait of Daniel Baker, his Great Great Grandfather. Thanks to Clive Minton for providing the carte-de-visite featuring the small portrait of a lady, believed to be a portrait of Mrs Sarah Bowen, the widow of Mr Pryce Bowen (1799-1865) of Montpelier Lodge, Brighton. I am also grateful to Andy Loakes who submitted the William Feldwicke portrait of Mrs Mary Hider [formerly Mary Sayers]. 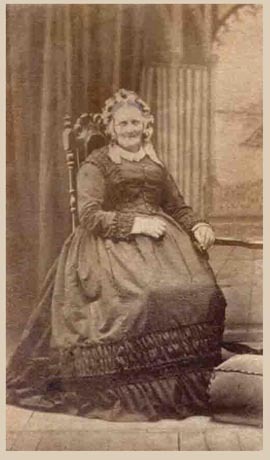 Mrs Mary Hider (1811-1885) is Andy's great, great, great grandmother.